JetBlue has been a favorite of frequent flyers since the low-cost airline came on the scene in 2000. Despite offering very affordable fares, the carrier didn’t skimp on service and that helped build a loyal customer base as well as industry accolades. In fact, JetBlue has won JD Power and Associates’ award for Top Low Cost Airline for Customer Satisfaction for 10 years in a row. If you’re not already a member of JetBlue’s loyalty program, you can sign up here. The company’s TrueBlue loyalty program is based on a revenue model so there is no award chart per se. According to the airline, the number of points it takes to redeem a specific flight depends upon the “published base fare at the time of booking, which depends on, among other things, the flight chosen and applicability of peak travel periods.” One-way flight awards start at 5,000 points and increase in 100-point increments. 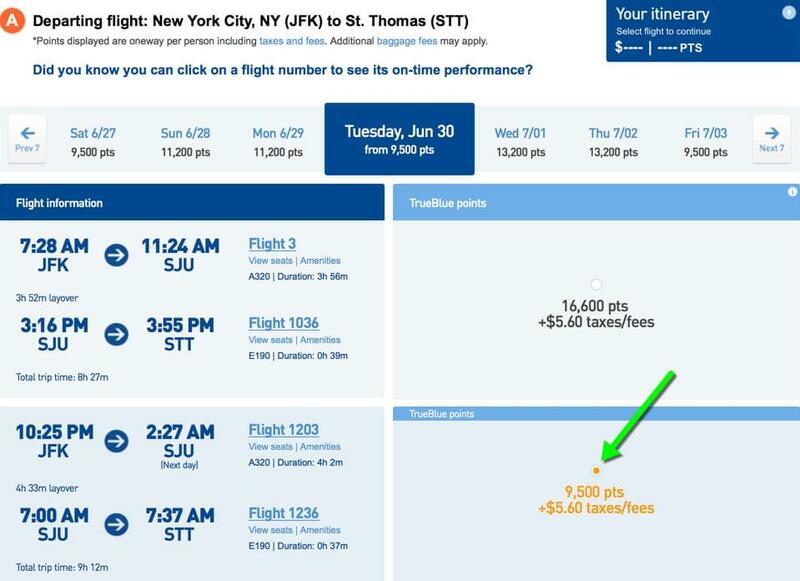 For example, one-way flights from New York’s JFK to St. Thomas (STT) in July range from 9,500 points (or $371) to 25,700 points (or $589), depending on the flights selected. In addition to the points, you’ll also owe cash for taxes and fees on all award tickets that you book. You’ll pay $5.60 for one-way domestic flights and, for international one-way routes, $5.60 to $161.50. The airline is not part of any alliance but it does have a few limited partnerships with other airlines, namely Hawaiian Airlines, Emirates and Silver Airways. While you can earn and redeem TrueBlue points on Hawaiian Airlines, your options with Emirates and Silver Airways are limited to earning points for flights on those airlines only. There are no redemption options with Emirates or Silver Airways. While JetBlue has some codeshare arrangements with other airlines like Aer Lingus, Cape Air, Icelandair and South African Airways, you cannot use TrueBlue points to redeem flights on those airlines. When Should You Use JetBlue Awards? 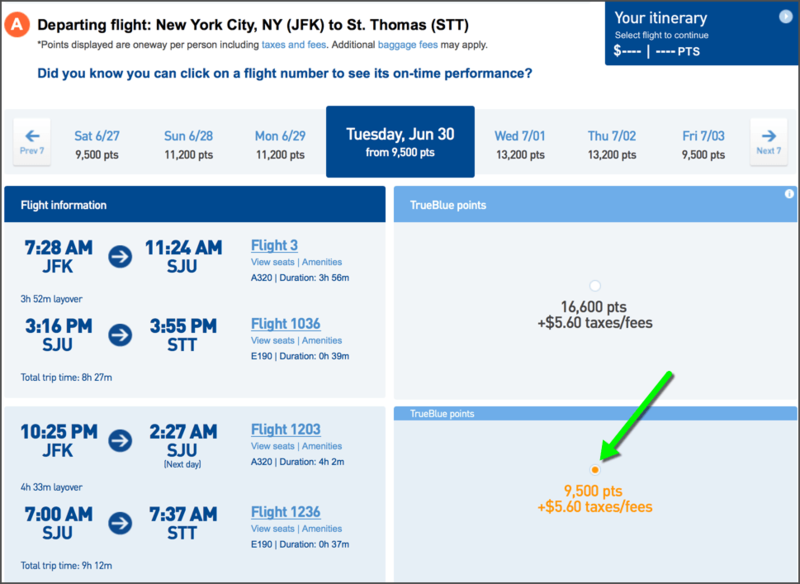 If you’re interested in booking an award flight with TrueBlue points, wait until JetBlue is running a sale”which they do frequently. 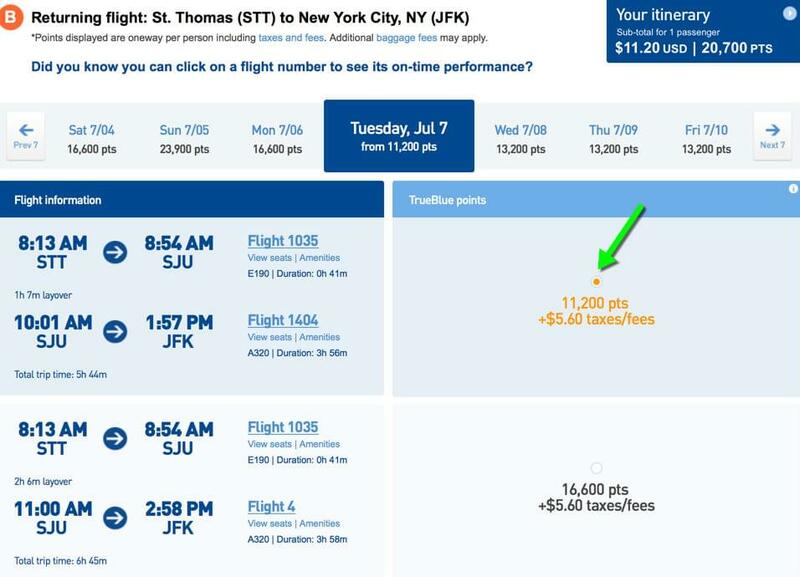 Since the number of award points necessary to book that award is directly based on the price of the flight, you’ll save points by booking awards during any of JetBlue’s fare sales. While you might not be keen on all aspects of a revenue-based loyalty system, TrueBlue has the terrific benefit of no blackout dates for award seats. If a seat can be purchased with cash, you can book it using your points. When booking a JetBlue flight with your points, you are limited to selecting seats in the Economy section. While you can’t redeem points for Even More Space seats (premium economy), you can often buy up to that section of the cabin using cash after you’ve made your award reservation. JetBlue flies to dozens of cities across America and has fantastic coverage of the Caribbean as well. Since JetBlue charges a $25 per person phone booking fee, you should only call in when you absolutely have to. Hawaiian Airlines flights are not bookable at JetBlue’s website so you must call in to make that redemption. 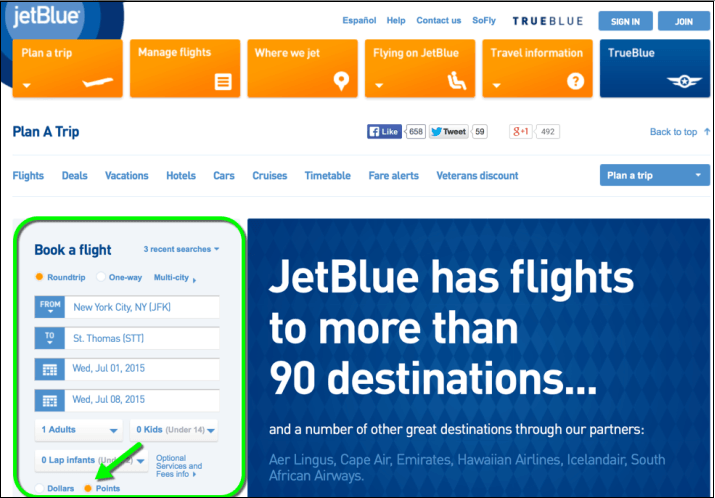 Start your award search at JetBlue.com and click on the “Plan a Trip” tab. Next, fill in the information requested in the “book a flight” box. Be sure to click the radio button labeled “points” and then click “find it.” If you’re not sure where you want to go, click on the “where we jet” tab at the top of the page to see all of the cities JetBlue serves. JetBlue will show you a calendar for award travel three days before and after your preferred dates. You can see which days have award tickets available for the lowest number of points. Once you decide which flights you want to book, click the radio button. The website will then show you return flight options, if you are searching for a round-trip award. Select your return flight(s) in the same manner as above. Scroll to the bottom of the page and you’ll see the number of points your award itinerary will cost as well as the cash payment for taxes and fees. Click “continue” if you’d like to book the award. If you don’t have enough points in your account, JetBlue will display this message telling you how many more points you need to book the trip. You can choose to pay in dollars or buy points. Don’t forget that you can also transfer American Express Membership Rewards points into JetBlue TrueBlue points. If you do have enough points in your account, JetBlue will step you through the rest of the booking process. You will need a credit card to pay for the taxes and fees. 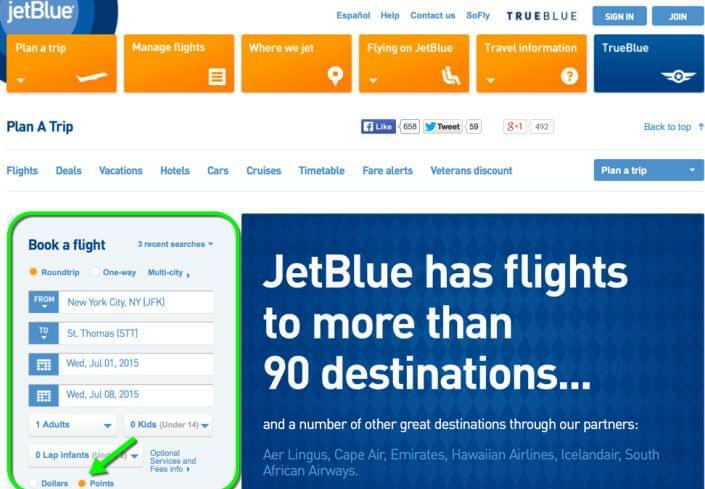 JetBlue doesn’t offer a dedicated service center or phone number for booking TrueBlue awards. You’ll dial the main number for reservations and follow the prompts to talk with someone about award travel. The reservations center is open 24 hours a day, seven days a week. Wait times for a representative vary from just a minute or two to nearly 10 minutes, depending on the day of the week, time that you call, and any external circumstances (i.e., a weather event causing a lot of changes to existing tickets). It’s not possible to book a TrueBlue award on an Hawaiian Airlines flight on JetBlue’s website so you’ll need to call the reservations lines. There is a $25 booking fee for speaking with a phone representative. JetBlue reservations agents are generally very knowledge and helpful and can answer any questions you may have about booking award tickets.